The collection includes pilgrimage accounts, which describe a ‘national’ circuit (as in Lady Nijo’s, c. 1280, or Sei Shonagon’s, c. 990, accounts) or move across vast regions to places of learning and pilgrimage or to a particular centre of religio-cultural significance (the early Chinese travellers to India in the fifth, sixth and seventh centuries, the Hajj pilgrimage of Ibn Jubayr in the 12th century, Blyden’s Africanist-Christian pilgrimage to the Holy Land in the 19th century). These pilgrimage accounts can also taper into other genres: for instance, while ibn Battutah (b. 1304) set out to go to Mecca (which he did), he ended up travelling across 50 countries and dictating what is undoubtedly a travel book in a narrow generic sense rather than the account of a pilgrimage. Other extracts range from the influential medieval travel-geography of al-Idrisi in the 11th century; the global history, including an autobiographical travel section, written by a Syrian scholar-prince in the 13th century; Ibn Majid’s (1460) first-hand nautical treatise, and the Turkish corsair Piri Reis’s (1470?) cartographic-travel poetry. Also included are extracts from Babur’s travel-autobiography (b. 1482) and Leo Africanus’s travel-study of Africa (1526). Shorter accounts, such as the description of a Viking funeral by a merchant from Baghdad in 922 AD, form another group of texts. Finally there is travel writing, such as that of Basho in the 17th century or Dean Mahomed in the 18th, which belongs to a distinctive literary genre, and even one contemporary bestseller: Olaudah Equiano’s 18th century account of his travels as a ‘slave’ kidnapped from his African village at the age of eleven, shipped through the arduous ‘Middle Passage’ of the Atlantic Ocean and sold to a planter in the New World. The accounts in this anthology include narratives of shipwreck and capture, slavery and freedom, monsoon and deserts, (homo/heterosexual) love and enmity, meditation and confusion, visits to famous cities and treks across unknown mountains, crowds of people and attacks by lions. Arranged in sections with clearly written introductions that situate the writing and highlight some salient features, the extracts included in this anthology not only make for fascinating reading, at times of texts that have never previously appeared in English, they also complicate notions of travel and travel writing. In this sense, the anthology would be of interest not only to students of Asian, African and colonial history and scholars in the fields of Cultural Studies and Postcolonialim, but also to students of travel writing in general. The introductory essay by Tabish Khair not only sets these accounts in historical and discursive context, but also refers to many other accounts absent from this anthology. 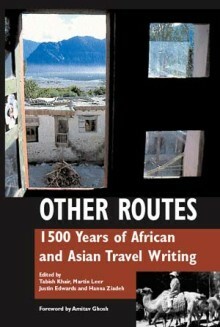 The introduction also provides the first published typology of Asian and African travel writing. Tabish Khair teaches at the University of Aarhus, Denmark; Justin Edwards is an associate professor at Copenhagen University, Denmark; Martin Leer is an associate professor at Copenhagen University, Denmark; Hanna Ziadeh is a consultant for the Danish Home Ministry.